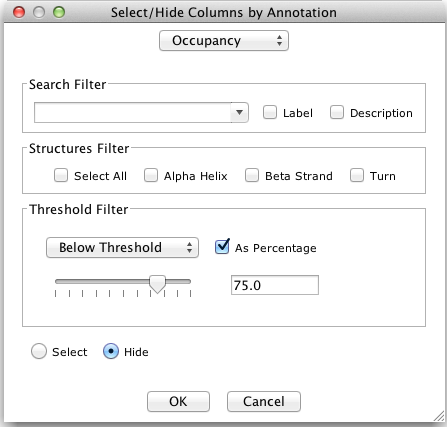 The 'Select/Hide by Annotation' window allows columns to be selected or hidden according to annotation rows on the alignment. The dialog box is opened via "Select→Select/Hide Columns by Annotation...", and different filters are then presented for filtering data according to the selected annotation row. The drop down menu lists the annotation available on the alignment. Sequence associated annotation rows will be shown with the sequence ID appended to the annotation label. It is only possible to select one row at a time. If an annotation with numeric values is selected, the threshold filter option is activated. For other types of annotation, use the text box and secondary structure check boxes (right). The radio buttons at the bottom of the dialog specify the action applied to columns matching the query. Note: annotation containing only numeric labels (e.g. T-COFFEE column confidence scores) will not be treated as quantitative data. You will need to enter search expressions to select columns in this case. Enter text or regular expressions in the text box to activate the 'Display Label' and 'Description' options. Selecting the description or label options will activate the filter, and any matching columns will be highlighted or hidden. Select the checkboxes to filter by secondary structure type. Select whether to filter the alignment above or below the threshold. Change the threshold value with the slider, or enter it in the text box. The As Percentage checkbox allows thresholds to be set as a percentage rather than absolute value. 'Select' (the default), selects columns matching the query settings. 'Hide' causes matching columns to be hidden. Hit 'Cancel' to restore the alignment view to its previous state before any filtering was applied.